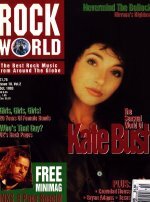 Browsing through the magaizne racks at the local newsagents I saw Kate's face on the front of a magazine called Rock World (Issue 19, Vol 2, Oct.). There is a 3 page article inside which includes a piece by Paddy Bush describing Kate and the making of The Red Shoes. There are a few black and white pics. "People always ask if we are ever going to do any more live shows. The answer is that it's certainly possible ... and in fact we talked about doing it recently. We even had a few rehearsals earlier in the year so it's definitely something in the head, but then Kate got involved in the idea of a film to go with the album .... all plans for live shows have gone out the window for the time being." "She doesn't really spend any longer on albums than anyone else ..."
"Believe it or not she actually writes very quickly." The article also has an "interesting top ten which it calls Kate Bush's finest hours and which has Babooshka at number 1 and The Dreaming at number 2. Kate and the new album are also mentioned in the mag's news section where they suugest the new album will take up residence at the top of the charts for the remainder of the year [if it ever gets released - nbc]. Also, that "sources" claim that it includes at least three smash hit singles. I wil post the full article if time permits and if no one else wants to do it first. Here is the Rock World article (Issue 10, Vol.2, Oct. 1993). KATE BUSH is back with a sensational new album 'The Red Shoes', her first of this decade. She's been a major figure for 17 years now, but still few people know what makes her tick or indeed what her songs are about. Kate isn't saying, so COLIN IRWIN speculates, while her brother PADDY, who's played on all her albums, offers his own insights. It's an event. A major, MAJOR event when Kate Bush releases a new album these days. New releases from Kate have become rarer than a sighting of the dodo. The new album 'The Red Shoes' has been threatened for three years, but even by Kate's own tortuous standards, it's been a painful one. Personal problems, including the death of her mother, permeated the recording...and it shows. It is a brilliant album. An album that features the likes of Eric Clapton, Jeff Beck and, most extraordinarily, Prince. But it is also an album that is acutely depressing, Kate's voice swooping and soaring dizzily through a heavy barrage of complex emotional puzzles dwelling on farewells and traumatic affairs. If we can ever read any personal outpourings in Bush's music, traditionally based on literature and wild, offbeat scenarios, then she's had a shattering of the heart in these lost years, too. Of course you can never be sure. She's always used her passion for fiction and escapism through drama and theatre as a way of camouflaging any reference to her own personal life in her music. And if anyone gets too curious about where the two may intermingle, then Kate ain't telling. Her interviews are few and far between and are legendary in the total lack of any revelations whatsoever. You come away from a meeting with Kate giggling, charmed, probably madly in love, and you couldn't care less that she's told you absolutely nothing about herself. Yet her songs have always held such mysteries and hidden depths, you can scarcely credit the person and the artist as occupying the same skin. But then that's the glorious enigma of Kate Bush. So 'The Red Shoes' maintains the tradition, and further fuels the myth and the mystery, taking its title and inspiration from an old Thirties movie and using subtle imagery and elusive lyrical reference points to counterpoint the intense passion she conjures up on virtually every track. The thing about Kate is that she wants everything to be absolutely right. When she writes a song she hears it in her head exactly how she wants it to sound and she'll go to any lengths to get it to sound like that and won't accept anything else. It's very hard for people to understand and everyone always wants to know why it's so long between albums, but it's just that perfectionism, that idea she has and not being able to stop until she gets it exactly right. She's painstaking in the studio and I know it can be frustrating for people, but she's right. It's the reason why she's always so original and distinctive. She has a vision of what she wants to achieve with a piece of music and she will not be deflected from it. It has been a difficult couple of years for Kate. For all of us. We've had personal upsets to deal with. Our mother died and we were all close to her, so that was hard and knocked us all sideways. I think we're all still recovering from that. To my mind the quality of the music justifies everything. People imagine Kate is this terrible paranoid creature, neurotic and full of hang-ups, but she's not like that at all. They think she's reclusive because she doesn't do a lot of press and promotion and isn't seen out and about, but she leads a regular life and believes the only thing interesting about her is the music. That's the only thing that sets her apart from anybody else and it's the one part of her life she feels comfortable discussing in public. I know this may give her a mystique and make the press all the more curious about her, but that's not the intention, it's not 'a ploy to get her more attention. She genuinely doesn't see why people should be interested in her personal life and she certainly doesn't like going out to clubs or trendy restaurants, it's just not her. So you never see anything about her in the gossip columns or much about her between records. That's just the way it is with her, and that's partly the reason why it seems there are long periods when she's not doing anything. She doesn't really spend any longer on albums than anyone else, it just seems that way because she doesn't go off on big promotional tours like most artists, so it looks like she's completely disappeared. She just prefers to spend that time on her music. Believe it or not she actually writes very quickly. Once she has an idea for a song she writes fast - she's brilliant like that. What takes the time is all the other bits that go with it, realising what she has visualised in music in the studio - and that can be a slow process. She will never settle for second-best. She is open to suggestions and ideas, however. As well as playing, I'm an instrument maker and I'm interested in lots of different kinds of music. Using the Trio Bulgarka on the last record came about after I'd started playing her that stuff. They're on the new one too. She's always interested in using different styles and cultures...like the aborigine influence on 'The Dreaming', on which we had Roll Harris playing didgeridoo. He was lovely, too, one of the nicest guys I've met and a great talent - that whole idea of being able to draw and then play a tune to go with it is fantastic. He taught us to play didgeridoo! Roger Whittaker's another lovely guy, and a great whistler, though it's hard to get him to whistle - he seems embarrassed about it. And I've fallen in love with music from Madagascar and I've been playing a lot of that stuff to Kate, and we've got that influence on the new album 'The Red Shoes'. We always had music all around us since we were kids. The family is Irish so we'd always be going across to Ireland and we had Irish music in the house all the time. I went on the road with the Irish fiddle player Kevin Burke and Kate moved on to the piano and started writing songs. I always knew she was special and the songs were great. She was signed to EMI for a couple of years before the first album came out and that was a very exciting time for all of us and, of course, it all took off from there. And we did the live dates, as well, which were brilliant. People always ask if we are ever going to do any more live shows. The answer is that it's certainly possible. It's not something that we've ever discounted and in fact we talked about doing it recently. We even had a few rehearsals earlier in the year so it's definitely something in the head, but then Kate got involved in the idea of a film to go with the album and she's been so busy on that all plans for live shows have gone out of the window for the time being. The film is gonna be mega. It's such an ambitious project because it has involved Kate in all sorts of things...writing scripts, editing all the music, directing. That's her thing. Mine's running around playing obscure instruments with foreign musicians. Kate's is very much film and art. She's done a few things with the Comic Strip people, which she loves doing. We've got Lenny Henry singing on one track on the new album. I'm still a very big fan of Kate's music, she always manages to surprise you, but she's still capable of producing the sweetest simplicity. Like 'Army Dreamers', which is one of my favourites of all the stuff she's done - it's a model of simplicity. But I must say I think the new album is the best thing she's ever done. It was a hard one to make, but it's a good one. KATE BUSH - THE LIFE STORY! Catherine Bush was born in Bexleyheath, Kent on July 30, 1958. After a recommendation from Dave Gilmour of Pink Floyd, Kate was signed to EMI in 1974. EMI decided to nurture their new 16 year-old and invest in her long-term future, delaying release of any material. Kate, meanwhile, took dance and mime lessons, and played gigs under the name the K.T.Bush Band (with brother Paddy and boyfriend Del Palmer on bass) around the South London pub circuit. The first Bush single 'Wuthering Heights', inspired by the Emily Bronte novel, was released in March, '78 and became a Number One hit. The success of the single was followed by the release of the first album 'The Kick Inside', which shocked audiences with its eccentric vocal approach and its unusual song matter. After a string of hit singles, Kate embarked on her first and (so far) only tour in the spring of '79 - a two and a half hour show full of experimental dance, theatre and choreograph routines. Kate became one of the pioneers of video with her imaginative promo films at the turn of the Eighties and also established herself as one of rock's most visionary thinkers with her brilliant 'Never For Ever' album. After a long silence, Kate returned in '85 with the acclaimed 'Hounds Of Love' album, including the hit jingles 'Running Up That Hill' and 'Cloudbusting', with a video starring Donald Sutherland. She had a hit duetting with Peter Gabriel on the hit single 'Don't Give Up' in '86 - continuing a partnership that had been established on Gabriel's 'Games Without Frontiers'. A compilation album 'The Whole Story' hit the top of the album charts in '87 while Bush also won a Brits Award as best female artist. 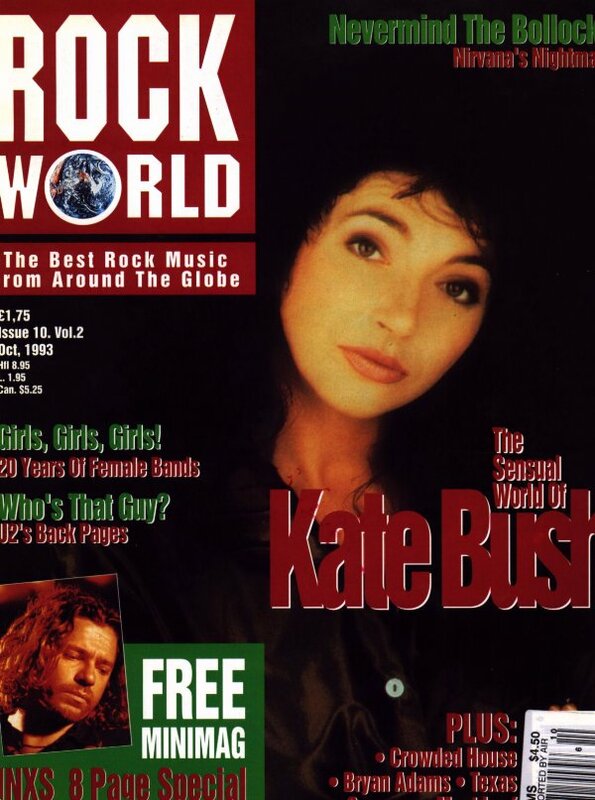 A new album 'The Sensual World' was issued in '89 and reaffirmed Kate's image as one of the deepest - and most mysterious - superstars on the planet. In lack of a new album, EMI issued a compilation LP 'This Woman's Work' in 1990, while Kate appeared at a fan club convention to announce that a brand new album would be out soon and that she'd be touring to promote it. Further bulletins about the imminent arrival of the new album continued for the next three years without any evidence, while Kate continued to pop up occasionally on comedy shows and other people's albums. At last the new Kate Bush album 'The Red Shoes' is released and it's fab!